Amazing action from the king of spies…. Wait! No, give me that book… Blood Honeymoon? I guess it will just be another of those same old spy books. Actually, this is pretty good… No, this is excellent! Riz broke new ground because it took a new situation and an old concept and melded the two together. What could have been very bad is actually very good. Now, we come to the latest addition in the cannon and what can I say? A wedding! Riz and Bang-Bang are getting hitched and nothing can possibly go wrong, can it? As it turns out, someone is emulating the ripper. Oh man, bye-bye Bang-Bang‘s wedding. Now it’s time to get serious. When people finally get sick of seeing James Bond, Harry Palmer and the other dudes getting it on in the 60s world of the cold war, they will look for a new kind ofspy novel and Riz will be waiting. 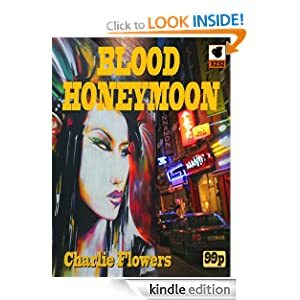 Charlie Flowers writes with fluency; he writes like a man who feels his characters, and I notice one lady in a review above complaining about the language. Well, frankly, these people do talk like that and they aren’t going to be gentlemen about it. Riz and Bang-Bang fight the bad guys and sometimes “darn it” doesn’t quite hit the mark. Excellent book from an excellent writer! We need more Riz by Flowers!